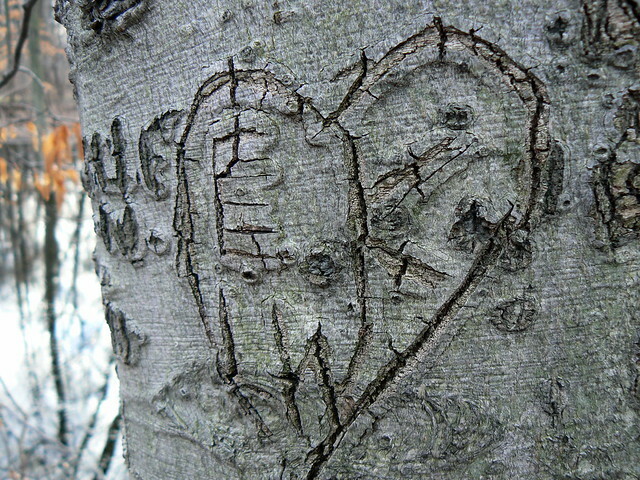 We’ve all on occasion seen words, images or initials carved into a tree’s bark. Whether the perpetrator acted to profess an eternal love for someone special or was simply looking to make his or her mark, many unsuspecting trees fall prey to this senseless act of tree-violence. It simply isn’t necessary! And it isn’t healthy for the trees involved, either. Large or small, any cut made into a tree causes serious, lasting damage. Food and water are transported directly under the bark through the phloem and xylem. Carving into this vascular system prevents the flow of nutrients to different parts of the tree, ultimately causing it to die. Wounds are most visibly made by knives and other sharp objects but can be caused by nails or staples, too. So next time you're hanging up a yard sale or lost dog sign, skip the trees in favor of the closest telephone poll. Birch and aspens are often the targets of tree carving artists. Their smooth, white surface offers a tempting canvas, but again, think of the tree! Trees already have many potential dangers in an urban environment; don’t add your artistic expression to that list. While today's tip is one preventive measure when considering a tree's health, there are many more proactive ways to care for your trees. Check out some previous Summer Tree Care tips on careful gardening, mulching and identifying pests, or take a look at our Calendar for upcoming tree care-related events and classes, including the Citizen Forester-qualifying class Stand Up for Trees on August 27.